Basically the reticle is the “sight” that you see through the scope tube and that you place on the target to effect your shot. In part one we discussed some scope basics as well as understanding the “power” rating of a scope. Selecting the right reticle for your scope is very important. Manufacturers produce reticles in an amazing variety of designs. To see the examples that Leupold makes, click here. Some are variations of crosshairs you place on the target, others have the capability to be range finders, and others have the ability to be illuminated by battery power for low light situations. The choices are too many to thoroughly discuss here, so I will simply discuss a small variety of major patterns and then will discuss the mil dot reticle scope. 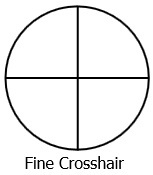 Simple cross hairs: This was the original type of cross hair reticle and for many years the only choice. The problem with it is that in low light the crosshairs can be difficult to see. Duplex: As the name indicates, it has two types or thicknesses of crosshairs. The heavy outer crosshairs make target acquisition quicker with the eye wanting to center the target inside them, and the fine crosshairs for actual sighting. All manufactures offer some version of a duplex reticle usually under their trade name. This is one of the most popular sight reticles around. Dot reticle: There are a very large number of variations on this reticle with each manufacturer making their own variations. Range finding reticles: Most manufacturers offer some sort of range finding reticle of various design systems. These are often set up to use the Minute of Angle system which is different than the Mil Dot system explained below. The one illustrated is just one example. Before you invest in one of these you need to understand that it takes practice, practice, practice to use them effectively. If you are not willing to invest the time and ammunition expense to learn their operation effectively on your rifle, then you are just wasting time and expense. 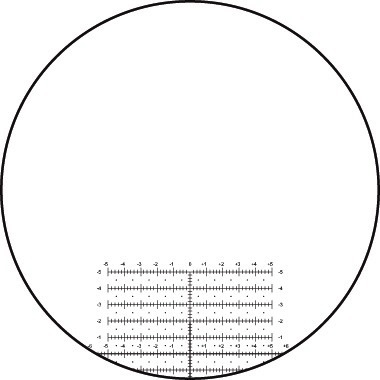 Mil Dot reticle: The Mil Dot reticle has been made popular by the military. It is designed to allow a sniper to accurately find the range to his target and then to compensate for that range by either holding the crosshairs above the target (hold over) or to adjust the elevation setting of his scope (come ups). Like any range finding scope, it takes practice to use effectively. I have noticed that the majority of the civilian shooters I see using Mill Dot reticles either do not understand their use, or get frustrated and give up trying. But for the sake of those of you who have one or are considering getting one, and want to understand it, I will give a brief description of how it is used. In order to understand how they work, you need to understand the measurement of mills. A mil is a measurement of angle. This can get interestingly complicated, but I am going to simplify this as much as possible. For a good explanation of mils, click here. 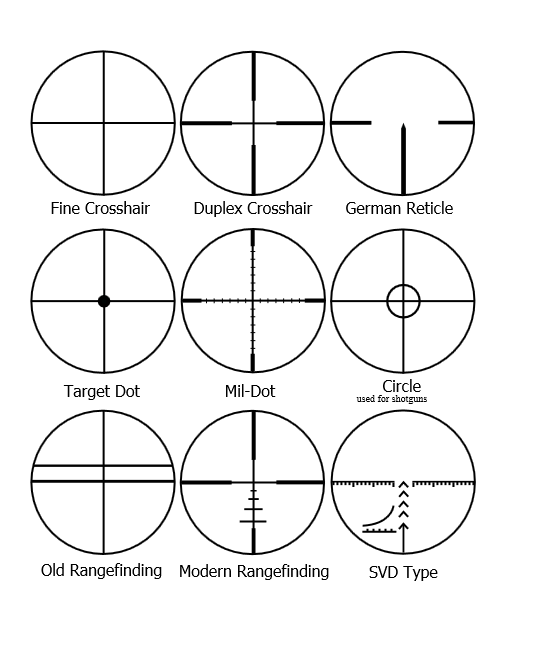 In the Mil Dot reticle example above, the distance from the center of one dot to the center of the next dot equals one mil either of the vertical line or the horizontal line. They are used to measure the range to the target. To find the approximate distance to a target using Mil Dot scopes you must know the approximate height of your target. Lets look at this from a tactical point of view. The average human being is going to measure approximately 18 inches from the top of the head to about the center of the torso. (height differences between ethnic groups is mostly length of legs). 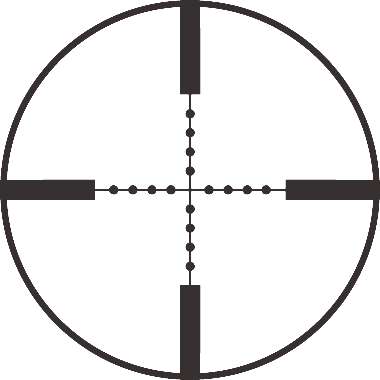 Place the center of the crosshair against one edge (top, bottom, or either side) of the target so that the crosshair extends along either its width or height. Using the dots measure along the crosshair to the opposite edge of the target. 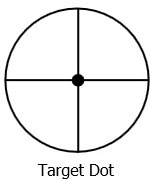 If the center of the crosshair is against one edge of the target and the opposite edge of the target is positioned behind the center of the second mil mark, the target measures 2 mils. Then use the following formula to figure the range to the target. Height of Target in Yards x 1,000 ÷ Height of Target in Mils = Range of the Target in Yards. This formula will also give results in metric terms if meters instead of yards are used in the equation. So for our example of a human target, the height is 18″ (.5 yards) x 1000=500÷ 2=250. The distance to the target is 250 yards. You will have to figure how much to hold over based on the ballistics of whatever cartridge you are using. This sounds a lot more complicated than it is, but the point is that in order to effectively use a quality scope, especially a range finding model, you have to be prepared to spend a bit of time learning and practicing. Honestly, for survival purposes, unless you are dedicated to learning how to use your Mil Dot (or other range finding) scope, you would be better off getting a quality fixed power scope and learning how much you have to hold over for various ranges with whatever cartridge and load you are using. However, if you are serious about becoming an accomplished long-range marksman, and are unable to take any of the quality training courses offered across the country, there is one text you really need to have. Maj. John Plaster wrote a book titled The Ultimate Sniper, which has become a standard text in world-wide militaries and police departments for long-range precision shooting. My dog-eared copy has been dragged around the world with me for years. There is a lot more to long-range shooting than just understanding how your scope works. Wind, light, and cartridge ballistics are also key factors and this book explains them and many other subjects. In Part 3, we will discuss how to zero your scope. I use a 30:30 reticule now yet still remember with great fondness how easy the POS reticule was for ranging, BDC, and wind comp? No math involved with using that puppy. Something I was really thankful of as I was never mental math minded. Might you include a section on illuminated reticules especially in respect to those used with NV. The misconceptions and misuse using those are many. Thanks. I remember the old ART scopes we used on M-21 systems ( National Match M-14). All you had to do was adjust the power until the large stadia line covered the area head to chest. No mental math involved. I was going to mention illuminated reticles, but like you, I see so much misunderstanding about them and night vision optics I decided to do a full article discussing both. Never seen or used one of those and yet again I learn something new. Adjustable zooms though. Moving parts, mud, -15, really really thick mittens? No, not for me. Set to 500m and chevron everything. POS style. Illuminated rets are a nightmare for the unskilled and positively dangerous with them forming false retinal images to confuse matters. Glad you are doing an article on them. The ART system ( Adjustable Ranging Telescope) used a ballistic cam at the back of the scope which matched the ballistics of the 7.62mm National Match load (now called Special Ball). You zeroed it at 300 meters on 3 power. Then, theoretically (and usually) as you adjusted the power up, the cam at the back of the scope raised the scope to match the range and power ( 6x was 600 meters). All you had to do was place the large reticle (which subtended 18″ at any power/range) on the target between the top of the head and the center of the chest to zero the scope for the range, place the crosshair on his chest and send him sleepy bye. Good system but it almost took three hands to operate and as you mentioned moving parts were an issue. Used successfully in Vietnam and by the Israelis since. I don’t think they are available to the general public anymore so I didn’t write about them. Wow, complex or as my dad often said “Too many moving parts son, it’ll never catch on”. Leatherwood Hi-Lux still makes the ART scopes and I bought one a while back. Very cool design that does what it claims to do. I am actually thinking about machining my own custom cam for it to handle my Alco loads. I taught my daughter to use it in 10 minutes and she was dinging steel every time out to 600 yards and had never shot beyond 150 before. I would be happy with this scope just for the optic, which is much higher quality than what I expected for the price, and I got the auto-ranging feature to boot. I was aware that Leatherwood was making a series of scopes billed as ART, but I was under the impression they had changed the system from the original military ART I and II I trained on. I will look into them and perhaps do a separate article on them. Of course is was Marine Lt. Leatherwood who invented the ART system used on the M-21 system. From what I understand the original ART’s were Redfield scopes with Leatherwood’s mount and cam system. The new ART is a Leatherwood Hi-Lux 2.5-10 scope with the Leatherwood mount and cam system. It is my understanding that they have made a few modifications to the mount/cam system, however it works in the exact same way as the original. I am shooting VLD bullets from Alco, so may need to machine a new cam for that, but for the 150gr surplus it is pretty much flawless. The original military ARTs were indeed manufactured by Redfield. They continued to make them for commercial sale up through the 80’s. I bought one to mount on my National Match M-14 which effectively gave me an M-21 sniper system. Unfortunately it got stolen. I will have to research the current crop made by Leatherwood. The ARTs I used in the Army were a good system, but were prone to mechanical problems under heavy field use. I suspect that is why the Army went to the Mil-Dot system when they went back to bolt guns for sniping. Also, you are pretty much limited to the load your cam is set up for. In the military that wasn’t an issue as the 7.62 Nato M-118 Match (now called Special Ball ) was the standardized load. 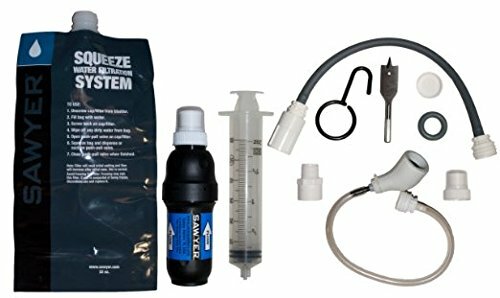 Is your scope set up to easily change the cam? You have “Minute of Angel” in the text, which should be “Minute of Angle” . Thanks for both the correction and the compliment.